Ken, Anny and I toured up to the Aigleton in the Belledonne range. There was a lot of snow transport (North to South) at and below the col with some consolidated snow in places. We figured the south facing slope has a fairly stable snow pack. The Aigleton weather station has recorded 60cm of fresh fince the weekend. The Vercors avalanche yesterday is pretty sad, a death and a serious injury. Young skiers, appears they didn’t have beacons. An avalanche dog had to be flown in from l’Alpe d’Huez to search for the victims. There have been a few other near misses in the area since Saturday. Ken has certainly falling on his feet - he came over here expecting the worse and look what he’s got. (assuming this is the same Ken that has posted recently). Conditions looked slightly heavy but what a change from the last month or so. Have fun. Yes I’m having fun, and it’s great to be able to take advantage of the fresh snow. * You’re right that the (generally S-facing) snow was kinda heavy—and the S-facing slopes were worse than “heavy” on Wednesday. * I’m rather glad I brought my old rock skis—as David advised. * Those weak underlying layers are still out there. And still deterring me from enjoying anything steeper. (until the SE slopes corn up maybe early next week). * No significant precipitation in the forecast for the next week or more in the northern French Alps. So the crevasses are not getting blocked, to be safer for the great high-mountain tours. The rocks are not sufficiently covered in lots of places—just hidden from sight, not shielded from ski base damage. Tomorrow’s avalanche bulleting reflects what Ken, Anny and I have observed touring for the last couple of days. Lots of wind from the NE -> E which has formed some new slabs on west sector slopes. This photo is of a slab under the Bottines near the Croix de Chamrousse, it was triggered by off piste skiers on Tuesday 1 March in the afternoon. I believe I heard a ‘whoumpf” today skiing the west face of the Petit Van at around 2100m, just a small local collapse of the snowpack. I didn’t mention this to Ken as I was preoccupied with an earlier binding prerelease. Ken is right, my skis have suffered badly the last couple of days. All repaired for the moment but a lot of rocks not far from the surface but invisible, you really need to give any outcrop a wider berth than I have done. Some more info on Monday’s fatal avalanche in the Vercors. The avalanche occured in the Rancs de Combevieux sector at Corrençon-en-Vercors. 30-40cm had fallen in the resort but the top of the couloir couple with steeper slopes had led to accumulations of 80cm. The victim, Jean Pollier, was well known on the plateau and amongst the Grenoble freestyle community. He had recently produced this film featuring his friends. Thomas Cuier, who was seriously injured, has been moved from intensive care today and his prospects look good. The alert was given by one of the survivors who had managed to grab hold of a tree. The rescue services found the first skier after 40 minutes under the slide, one of his poles was visible on the surface. He managed to create a small air pocket under 60cm of snow. The other victims were buried for more than an hour. Yesterday we were piste skiing, the closing day of St Hilaire, baring miracle snowfall. There has been a lot of snow in Corsica and it is still snowing a bit in the Queyras and Pyrenees. Watch out for avalanche in those areas (as well as elsewhere). Three ski tourers were caught by an avalanche in the Chablais yesterday under the pointe de Bénevent. They triggered the slide, which ran around 300m, just before midday. Two of the skiers were taken by helicopter to hospital in Monthey (Swiss Valais). A reminder that your medical and mountain rescue insurance may need to cover you in another country if you are touring near a border. 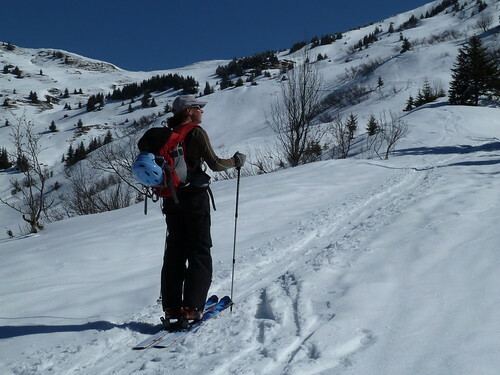 No sign of the two snowshoers who disappeared in the Pyrenees at the end of last month. Seems like glacier routes are continuing to cause problems. An Italian climber was killed in a crevasse fall today on the Vallée Blanche between the Helbronner and Aiguille du Midi. The victim was on snowshoes but was not roped up with his climbing partner. Lack of snow is once again very serious in most ranges, it affects all altitudes but is less severe above 2200m. Snow cover is amongst the worst for 30 to 40 years, in some places the worst. The Isere and Haute-Maurienne are less bad above 2000m where snow cover is near average. Due to the amount of sunshine there is a stark contrast between sunny and shaded slopes. Snow cover can be found from 1100m on North facing slopes, 1500->1800m on south faces. There is a good refreeze on south faces. At 2500m there is 150->200cm of depth except in the Vanoies, Haute-Tarentaise and Maurienne where there is about a meter. On South faces there is less than 30cm at 2000m except in the Beaufortin, Haute-Tarentaise, Haute-Maurienne and Belledonne where there is up to 50cm. Snow cover is currently good in the Western and Central Pyrenees after the snowfall at the end of February. You can ski down to 1200-1300 on some sheltered north facing slope but you have to climb to 1800-2000m. on southern slopes. Snowfall was at times more abundant than in the North. Snow cover is relatively good, above 1800m at least. It is excellent on the Italian border, particularly in the Mercantour. At 2000m there is 70-100cm of snoe depth reaching 130cm in the Pelvoux and Mercantour on Southern Slopes at 2000 m there is 100cm in the Mercantour. Discontinuous snow cover, still possible to ski in some sheltered north facing couloirs (Hohneck/Fallimont). We’ve spent the last couple of days piste skiing. Very warm with a lot of water on the south facing runs by 3pm. Weather is due to change with a storm coming up from the South. Snow level in the Hautes-Alpes will be around 900m with the snow moving into the Northern Alps on Sunday from 1000m. Doesn’t look like there will be much snow though. Should be good for the resorts which are really suffering now. Well not much snow to date, about 5cm at 1600 m. last night but a strong foehn yesterday in a lot of the French Alps which hasn’t done a great deal to improve conditions. It is snowing again now but the zero iso is around 1800m (snow down to 1500m then). Snowfall is less than 25% of normal in some areas of the Northern Alps this year. A lot of avalanche activity in Switzerland over the weekend. On Sunday a 43 year old man and his 11 year old son were killed at Super St Bernard (Ise probably knows more about this). The body of the son was only found on Monday at 16h00 after 22 hours of searching. The alert was given by the wife of the victim on Sunday night without knowing where her husband and son had gone. The police geolocalized the victim’s telephone to locate his car in the parking lot of the ex-ski station of Super St Bernard. Rescue workers spotted a snow slide above the car park close to the ski lifts. A ski was found at 02h00 and the man’s body shortly afterwards. The operation involved over 100 S&R members. The Swiss Alpine Club (CAS) suffered 2 deaths in an outing at Zermatt on Saturday. Both victims were in their 50s and Swiss. 10 ski tourers, members of the Soleure section of the CAS where skiing on the Triftjigletscher when an avalanche buried 3 of the group. One of the buried skiers was rescued by the group but they had to await outside intervention to find the other two victims. On Sunday a 43 year old man and his 11 year old son were killed at Super St Bernard (Ise probably knows more about this). I get all my news here ! There was a bit in Matin I was reading on the train about it. Someone also died on the Wildstrubel at the weekend after collapsing with medical problems, not sure if this was the rescue/search/recovery that Andy Perkins was involved in or not. Update on the avalanche conditions, risk 3 this afternoon on the Belledonne and Grandes Rousses with the snow limit around 1650m at 2pm dropping to 1400m during the course of the afternoon. As you can see from the photo the snow is very heavy, this slide, about 20 meters across was some 40cm deep, taking the 15cm of fresh snow and the layer that fell about 10 days ago. In the Ceillac a Dutch ski tourer was buried by a slide yesterday, no idea of injuries. He was touring with a party led by a German guide below the col du Tronchet. The avalanche risk should decrease tomorrow a bit, although it will need a good refreeze to really stabilize and be skiable. You could poke a ski pole down through the entire snowpack (100-120cm). The Tronchet victim was suffering from shock but otherwise unharmed. He was buried under 50cm of snow. Very few people out (would normally be very popular on a day like today) and had only seen a dozen tracks on Sunday. We had to walk for 10 min to get from the car to the snow (normally at this time of year it would be snow down to the road) and in a week it’ll be 30 or 40 min walking which will be too much to make this route worthwhile. After a very warm period from Th -> Sa the week has started with a return to more unsettled conditions. Good news is that it has snowed down to 1600m (about 5-10cm at this altitude - 1400m in the Western Pyrenees) rising to 20cm at 1950m above Celliers in the Lauzier (to cite one example). The fresh snow has fallen without much wind. There is less snow in the interior ranges towards the border with Italy. The new snow has fallen on a snow pack that is humid over nearly its full depth so conditions are liable to be unstable with some purges, especially below 2200m. The rain below 1800->1600m has affected conditions lower down. Generally the skiable snow line is around 2000m in the south, 1400m in the north.